Living standards rise when wages increase faster than inflation. When companies are able to reduce the price of goods and services they offer, that helps lower inflation and – all things being equal – increases living standards. But not all cost cutting techniques are equal. Lowering costs through efficiency improvements is very different than lowering them through pay cuts. For example, consider the Ford Model T. Through improvements in processes and technology, Henry Ford was able to reduce the price of the Model T from $825 in 1908 to just $440 in 1915. Eventually, it’s price dropped to as low as $260. On October 7, 1913, a rudimentary final assembly line was rigged at the new Highland Park plant. A chassis was pulled slowly across the factory floor by rope and windlass. Parts and 140 assemblers were stationed along the 150-foot line. As the winch dragged the chassis across the floor, workers attached parts to the car. With this new assembly line, production time for a single vehicle fell from 12 hours and 30 minutes to five hours and 50 minutes. Soon the line was improved with a power-drive “endless” conveyor system that was flush with the floor and wide enough to accommodate the chassis with room for workers on both sides. By 1914, continuous improvement had whittled the time required for assembly to 93 minutes. In just 6 years, Henry Ford reduced assembly time by 94% through the implementation of the assembly line. He was able to drastically cut the price of the Model T by making the process more efficient, not by cutting his workers’ pay. In fact, in 1914 he was able to raise the pay of his workers from $2.83 for a 9-hour day to $5.00 for an 8-hour day – enough for a Ford employee to afford a Model T of his own after only 88 days of work. Now imagine an entire economy becoming more productive through innovation and then passing a significant amount of that extra productivity to employees. This creates a virtuous cycle where employee’s extra purchasing power improves business throughout the entire economy. Alternatively, consider the situation where costs are lowered through pay cuts. If Ford had continued producing the Model T in the same fashion, but reduced costs purely by cutting workers’ pay, everyone that didn’t work for Ford would be better off, but Ford employees would be worse off. Again, imagine an entire economy reducing costs through pay cuts. As opposed to the first example, this would create a vicious cycle where less purchasing power would weaken the overall economy. When the price of goods and services decrease due to improvements in productivity we are all better off – especially when improved productivity is passed on to employees. When those price drops occur from falling wages, we aren’t. Today’s economy could use more businessmen like Henry Ford, and fewer like the Walton Family. 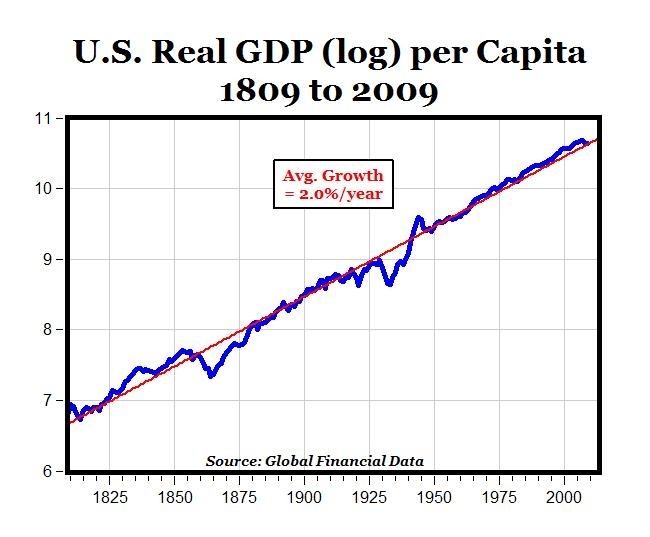 For the last two hundred years, there has been an incredible trend in productivity growth. On average, the US economy has been able to produce almost 2% more per person per year. Over time, this seemingly small amount can be significant. 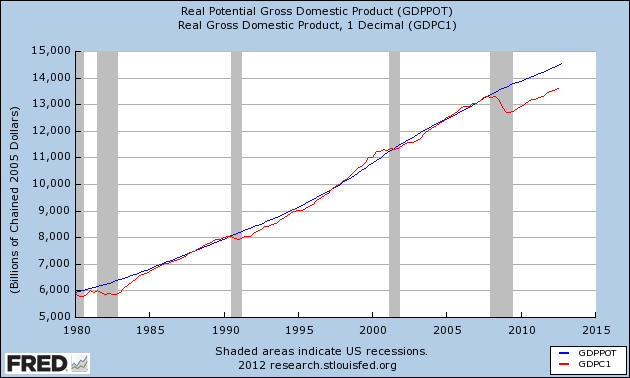 For example, over the last 30 years, real GDP per Capita increased 64% – from $26,030 to $42,671. This implies that the standard of living for the average American should be 64% higher. But as American workers become more productive, the only way the economy can continue the trend is if consumers are able to increase consumption at the same rate. The most obvious way consumption can keep up with production is if wages do. Unfortunately, since the mid-1970’s, they haven’t. I’ve presented this graph before, it shows Employee Compensation as a percent of GDP – and it’s dramatic decline over the last 30+ years. 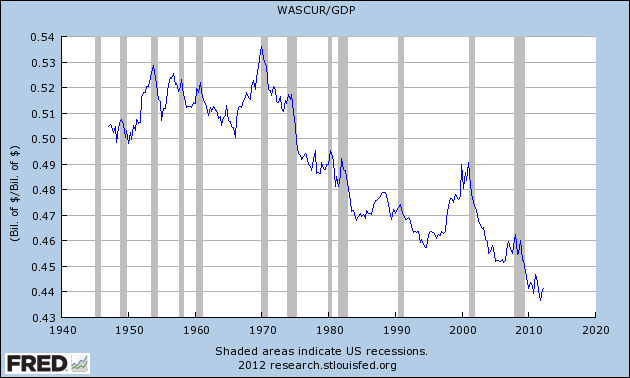 But even with declining wages, the US economy was able – until 2007 – to keep up with it’s long-term trend. As I have claimed in the past, the reason the economy was able to keep growing despite falling incomes is because American households made up for stagnant wages by borrowing the difference. Let’s see if the data support my contention. 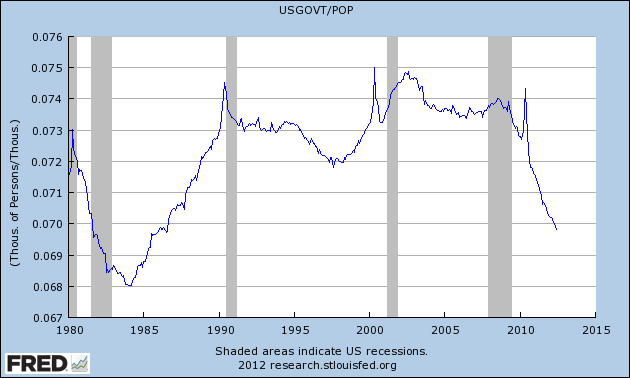 The following graph shows net borrowing as a percent of GDP. After averaging less than 5 percent per year before 1984, borrowing increased to about 8 percent from the mid-80’s through 2000. It then went to unsustainably high levels in the seven years leading up to the Financial Crisis. Not-so-coincidentally, net borrowing levels are almost identical to the drop in Employee Compensation. This last graph combines Employee Compensation with net household borrowing and compares it to the GDP output gap (Potential GDP- Actual GDP). Note: The GDP output gap has been inverted to better show correlation. The correlation is almost perfect – the correlation coefficient = 0.931. The economy will not return to normal until wages increase or borrowing resumes. High unemployment and foreign competition should keep wages from rising for the foreseeable future, and high household debt levels will make additional borrowing unlikely. Full employment is probably still several years away. Last night was the third and final Presidential Debate. The number one theme throughout all three was, obviously, the economy. Every other issue pales in comparison to the current economic situation. But the most striking thing to me was how little was said about what I believe are it’s two biggest problems: Housing and Income Inequality. Short term, the biggest reason for the lackluster recovery is housing. With the exception of the dot-com recession of 2001, every post-WWII recovery was driven by a pick up in Residential Investment. 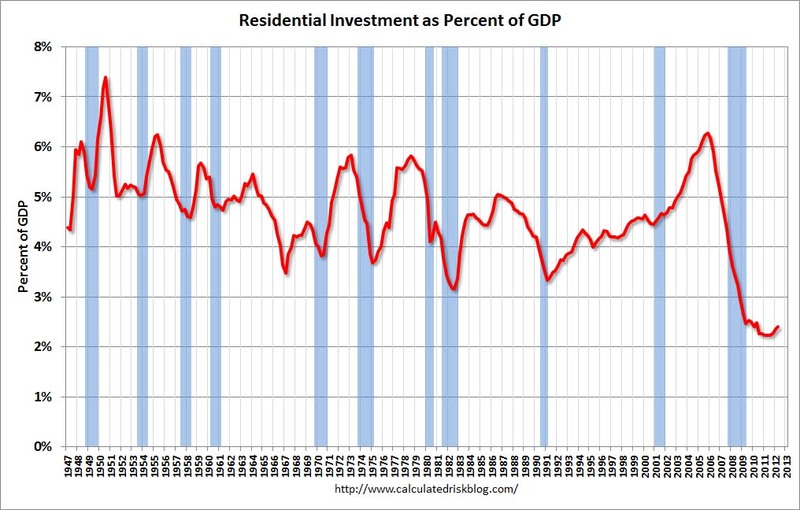 Since the Housing Bubble burst, the contribution from Residential Investment has been at historic lows – a full 2 percentage points lower than average. Once it gets back to average, GDP growth will be 2 points higher. This would take our current growth rate from the latest 1.3% figure up to 3.3%. Now that the excess inventory of the bubble has been absorbed, we should see a noticeable increase in growth the next few years regardless of who wins the election. Long term, there is a problem with rising income inequality. In The Great Crash 1929 by John Kenneth Galbraith, he lists high income inequality in the late 1920’s as being the most important cause of the Great Depression. 1. The bad distribution of income. In 1929 the rich were indubitably rich. The figures are not entirely satisfactory, but it seems certain that the 5 percent of the population with the highest incomes in that year received approximately one third of all personal income. The proportion of personal income received in the form of interest, dividends, and rent – the income, broadly speaking, of the well-to-do – was about twice as great as in the years following the Second World War. Between 1980 and 2007, the top 5% saw their share of income rise from 21% to 37%. In the first year of the Great Recession, income inequality was similar to 1929 levels. Why does this matter? Because our economy is primarily consumer driven. Consumption levels of the rich don’t vary much with their income. For example, the average income for the top 5% in 2009 was $359,781. A drop of even 20% – to $287,825 probably wouldn’t result in people at that income level cutting back much on spending. But when people in lower income levels get squeezed, they cut back or borrow. Between 1980 and 2007 they chose to borrow – this gave the illusion of a healthy middle class. 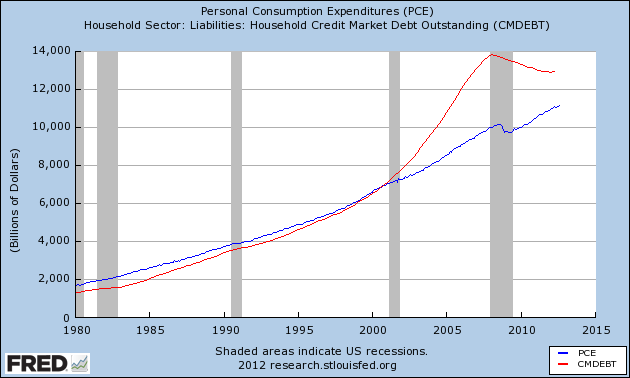 Now they are beginning to pay down that debt which has led to a big drop in consumption. The persistent weakness in consumer spending – which is well below trend – has led to a corresponding weakness in economic growth. 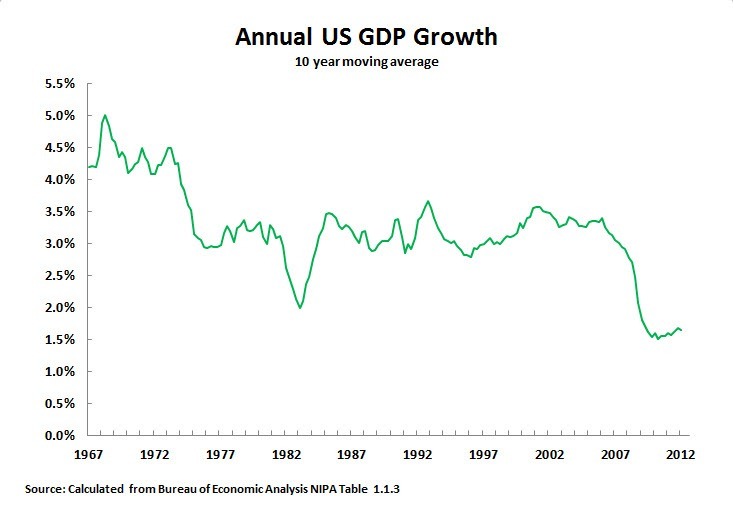 Unless something is done to address the long-term rise in income inequality, US economic growth could remain weaker than normal for quite some time. Continuing on the theme of my last post about historic lows in Employee Compensation, the picture gets even worse when you also factor in the big increase in income inequality since the 1970’s. This means most Americans are getting a smaller share of a declining piece of the pie. 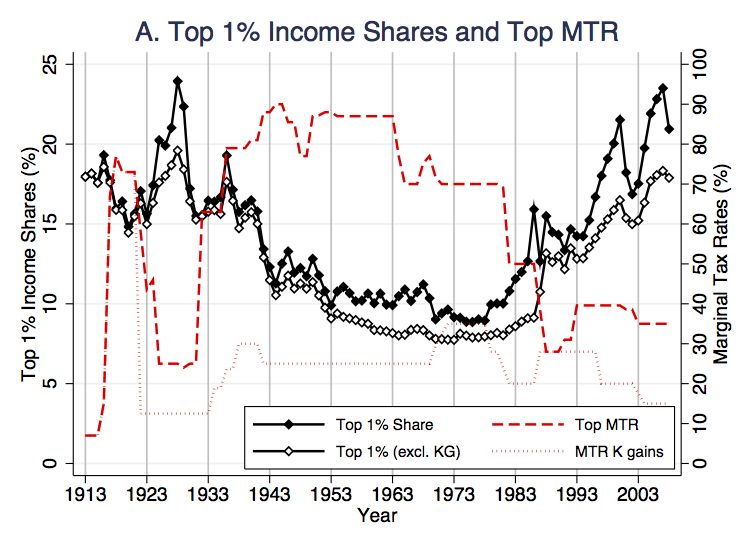 According to analysis by Emmanuel Saez, the share of wage and salary income going to the top 1% increased from 5.1% in 1970 to 12.0% in 2006. Alternatively, the share going to the bottom 99% dropped from 94.9% to 88.0%. Over that same time frame, total Employee Compensation dropped from 52% of GDP to 45.2%. Combining both statistics, we can estimate total compensation as a percent of GDP for the 99%. 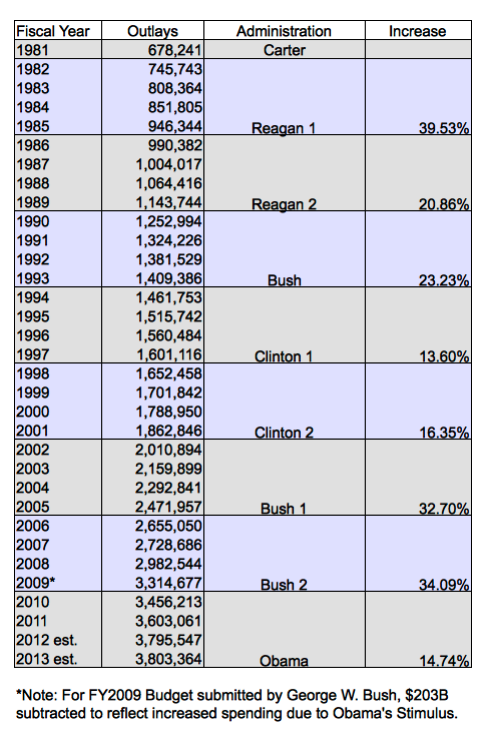 In 1970 it was 49.3%, but by 2006 it had decreased to 39.8%. That’s a 19% pay cut. How have they tried to compensate? By borrowing to make up the difference. 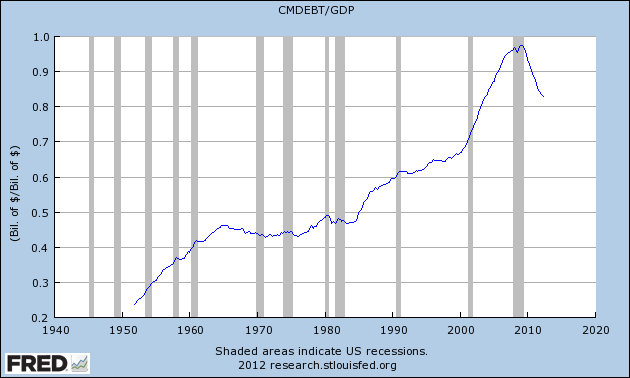 Between 1970 and 2006, household debt increased from 44% of GDP to 93%. Since 2009, households have been paying the bill. 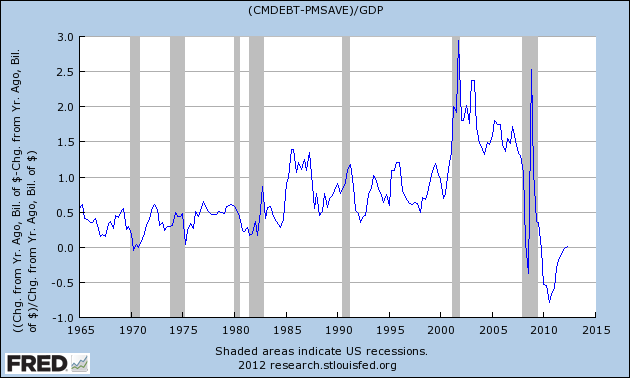 This is one reason why this recovery has been so weak. Hyman Minsky referred to this as the Paradox of Deleveraging. Janet L. Yellen, President of the Federal Reserve Bank of San Francisco explains how it relates to our current situation. A process of balance sheet deleveraging has spread to nearly every corner of the economy. Consumers are pulling back on purchases, especially on durable goods, to build their savings. Businesses are cancelling planned investments and laying off workers to preserve cash. And, financial institutions are shrinking assets to bolster capital and improve their chances of weathering the current storm. Once again, Minsky understood this dynamic. He spoke of the paradox of deleveraging, in which precautions that may be smart for individuals and firms—and indeed essential to return the economy to a normal state—nevertheless magnify the distress of the economy as a whole. Do Without. This is the responsible thing to do, but results in poor economic growth. Borrow. This allows the economy to grow, but only until debt load limits are reached. Most Americans took option #2. The borrowing spree of the last few decades masked the problem of rising inequality. That all changed in 2007 when household debt hit a record high. Going forward, we have two choices. We can begin reversing the policies that led to high income inequality, or we can wait for Americans to resume their borrowing spree. The choice seems clear. 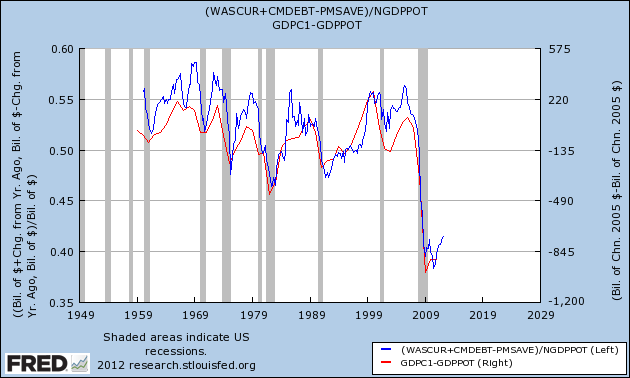 Are High Corporate Profits A Problem? The recent jump in Corporate Profits as a percent of GDP has come at the same time as a big fall in Employee Compensation – now at records lows. It turns out that some things are a zero sum game. Throughout the 1950’s and 1960’s – the Golden Age for the middle class – Employee Compensation stayed above 50% of GDP. During this period, the US enjoyed strong economic growth, low unemployment, low household debt loads and declining government debt. After declining for the last 30+ years, Employee Compensation is now only 44% of GDP and we have weak economic growth, high unemployment, high household debt loads and rising government debt. Coincidence? I think not. 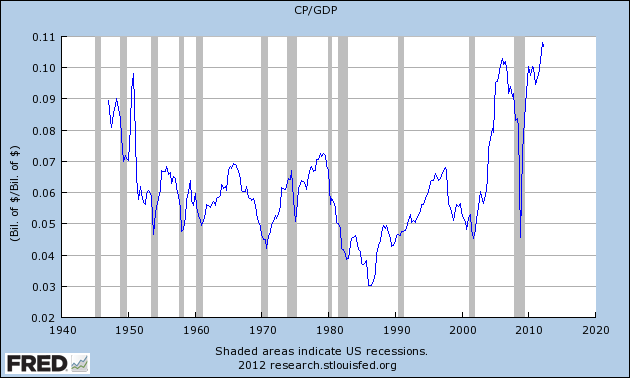 After averaging 6% of GDP for the last 60 years, after-tax corporate profits are now at over 10.5%! This is the highest level since official records began in 1947. This is certainly great news for the economy, stock holders and corporate executives. In 2011 the chief executives of the 500 biggest companies in the U.S. (as measured by a composite ranking of sales, profits, assets and market value) got a collective pay raise of 16% last year, to $5.2 billion. This compares with a 3% pay raise for the average American worker. The total averages out to $10.5 million apiece. But after knowing this fact, can anybody still say that a corporate tax cut is needed to help create jobs? 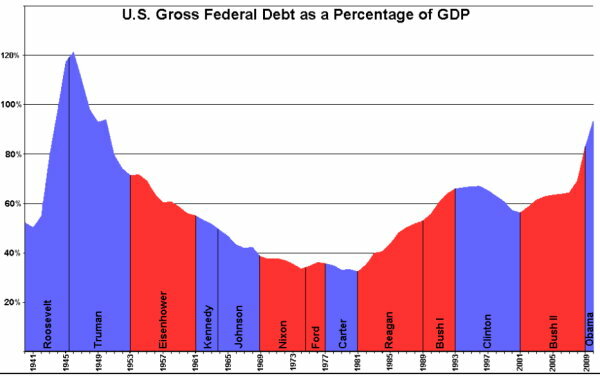 Because of the Great Depression, WWII and the subsequent rebuilding of Europe, the US National Debt exploded to about 120% of GDP in 1946. After 1946, the National Debt had been steadily declining for 35 years. Ronald Reagan’s irresponsible fiscal policies ended that and the National Debt began to increase rapidly. That’s the part of Reagan’s legacy that seems to have been forgotten by today’s GOP. The Republican party has been the bigger spenders ever since, as Ron Paul prophetically said in his 1987 resignation letter from the GOP. And yet, how many times have Republicans accused the Democrats of increasing spending and deficits? And worse, how many people accept this Republican myth as fact? The actual fact is that – for at least 30 years – Democrats have been much more frugal than Republicans. Here are the actual spending numbers for each Fiscal Year since 1981 showing total spending increases for each four year Presidential term. The three smallest increases were Bill Clinton’s two terms and Obama’s first. Factcheck.org has performed a thorough analysis of FY2009 spending and has concluded that $203B of 2009 spending was the responsibility of President Obama. The numbers in this table have been updated to reflect that fact. Look, I got five boys. I’m used to people saying something that’s not always true, but just keep on repeating it and ultimately hoping I’ll believe it — but that — that is not the case, all right? Unfortunately, in this case it is true. Republicans have been repeating the “big spending liberal” lie for so long that most people do believe it. The overwhelming consensus is that Mitt Romney won the first debate. Romney appeared clear, concise and confident, while Obama seemed to wander and ramble a bit. So, from a style perspective, Romney performed better. But when you consider how Romney was able to accomplish this, his performance was much less impressive. When a debater points out some of your unpopular or controversial positions, it forces you to defend them. Doing this can make you appear defensive or lacking in confidence or conviction. Last night, Mitt Romney found another way to deal with the issue – Just Deny It™. America’s individual tax code applies relatively high marginal tax rates on a narrow tax base. Those high rates discourage work and entrepreneurship, as well as savings and investment. With 54 percent of private sector workers employed outside of corporations, individual rates also define the incentives for job-creating businesses. Lower marginal tax rates secure for all Americans the economic gains from tax reform. And finally, with regards to that tax cut, look, I’m not looking to cut massive taxes and to reduce the — the revenues going to the government. My — my number one principle is there’ll be no tax cut that adds to the deficit. The total number of people employed at all levels of government is now 700,000+ lower than it was at the start of 2009 – when it peaked. Note: The spike in 2010 was due to temporary census hiring. 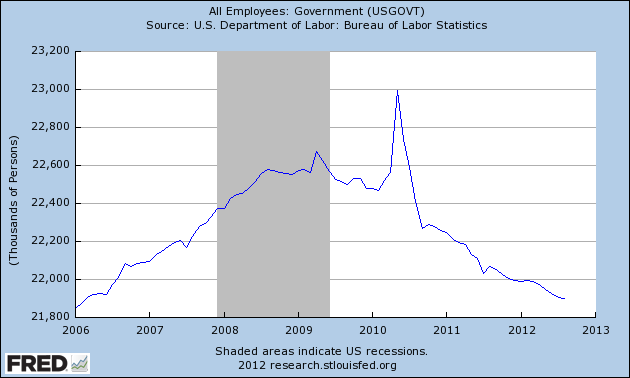 As a percent of the population, government employment has fallen from 7.4% to just under 7.0% over that same time period. This is the lowest level since 1987.